Kerrie’s Alphabet of Crime community meme over at the Mysteries in Paradise blog this week reaches the letter E. Those participating will post a review, author biog or a thematic item that matches the letter of the week either with the first letter of the title or the name or surname of the author. Stanley Bernard Ellin was born in Brooklyn on 6 October 1916 and was thirty years old when he, after a stint in the army as well as a variety of jobs, became a full-time writer with the blessing and financial support of his wife Jeanne Michael. 1948 saw this finally pay off, and handsomely too, with both the publication of ‘The Specialty of the House’ and his first novel, Dreadful Summit, which was filmed shortly afterwards by Joseph Losey as The Big Night with a screenplay co-written by Ellin himself. While a few of his novels have been filmed over the years (and the short story ‘The Best of Everything’ was the basis in 1964 for Nothing But the Best), the TV adaptations of his shorter works for such anthologies as Alfred Hitchcock Presents and Tales of the Unexpected were probably much more widely seen. “… the finest collection of stories in the crime form published in the past half century”. It was followed by The Blessington Method (1964) and Kindly Dig Your Grave (1975); all three were then republished in 1979 with a few additions in a single omnibus volume, The Specialty of the House, named for his debut story, which remained his best known single work though he wrote a dozen equally as good as the tart and macabre tale of Sbirro’s Restaurant and its very special ‘special’. Perhaps appropriately, Dreadful Summit is a gritty coming of age story of a boy who sets out to avenge his father’s humiliation by committing murder. 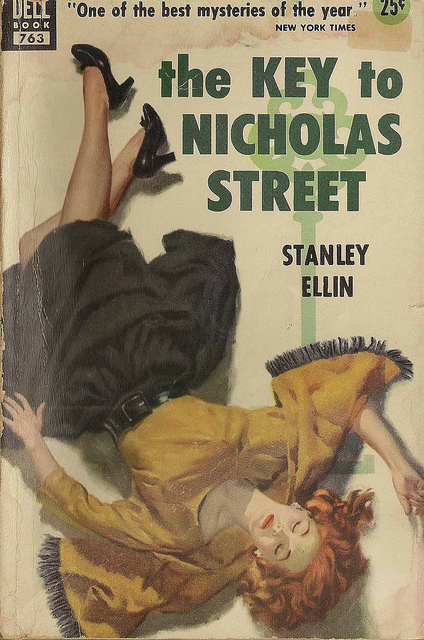 Its follow-up, The Key to Nicholas Street, is a superb tale told from five perspectives and takes the classic Christie scenario in which the most disliked person is found murdered to deliver a subtle and intelligent variation on the theme. The Eighth Circle also takes a classic premise – it is a private eye yarn with a protagonist very much in the style of Hammett’s Sam Spade in The Maltese Falcon, who solves his partner’s murder even though he was actually having an affair with his wife – and updates it to provide an ethical mystery that may be Ellin’s finest full-length work and which also won him the Edgar. 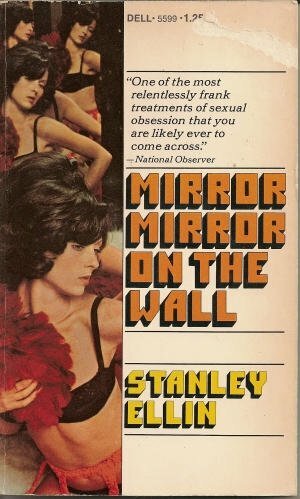 In the 1960s wrote a series of perhaps more conventional thrillers set around the world such as House of Cards (1963) and The Valentine Estate (1968) but once again delivered a more experimental short book, Mirror, Mirror on the Wall (1972), a psycho-sexual masterpiece as brave as it was unexpected and which was listed in HRF Keating’s list of 100 best crime and mystery books (for the full list, click here). It is certainly one of my favourite Ellin novels, though one that is unusually vulnerable to spoilers and is best read without any previous knowledge about its story and main character. This was followed by Stronghold, an imaginatively developed hostage story that also examined the author’s own beliefs as a Quaker. Ellin continued to show that he was still able to shock and innovate when his usual publisher, Random House, rejected The Dark Fantastic (1983) for its uncompromising portrait of a psychopathic bigot. 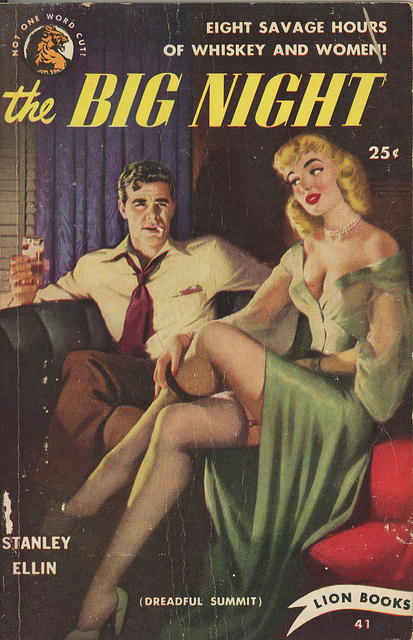 This was the second of two novels featuring private eye John Milano, the only recurring character in the author’s work. For the most part his stories were too distinctive to conform to a series pattern and each new book would often provide a radical departure from the one that preceded it. Ellin died on 31 July 1986 leaving a legacy of some fifteen novels and three-dozen short stories. He is gone, but not forgotten. I hope to post reviews of many of his books over the next few months. This entry was posted in 2012 Alphabet of Crime, Alfred Hitchcock, Crime Fiction Alphabet, Fredric Brown, HRF Keating, Julian Symons, Private Eye, Stanley Ellin and tagged ellin stanley. Bookmark the permalink. What an interesting post. 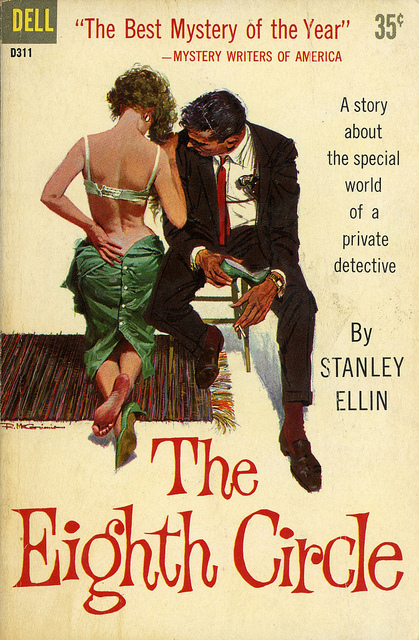 I had heard of Stanley Ellin; I have been reading through some of my mystery reference books. I am not much of a short story reader, and I am sure I should remedy that. Regardless, the novels you featured sound interesting. Hi Tracy, thanks for the comments. 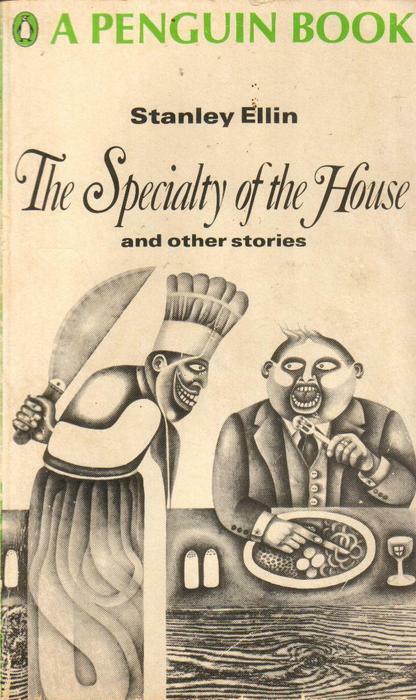 Ellin was certainly a major figure in the 50s, especially for his short stories, and many have been anthologised very frequently, Specialty of the House always being given pride of place but he was a remarkable author in many ways, well worth tracking down if you can. The novels from the 60s may be the less interesting ones if I had to make a sweeping assessment because they are more conventional but his prose his unadorned and clear, his ideas strong and original and and at best truly challenging. There’s not a lot of crime fiction authors you can accuse that of. Certainly not enough anyway. I will definitely seek out The Key to Nicholas Street and the Eighth Circle. The paperback editions would be worth having just for the covers. Cover art for for The Eighth Circle is Robert McGinnis! And then go from there, after I try those. I have this book: The Paperback Covers of Robert McGinnis. Amazon tells me I purchased it in 2005. Hard to believe. I know Ellin’s work as a story writer not as a novelist. One of these days I’ll get to reading The Eighth Circle, an Edgar winner I think. But I did see A DOUBLE TOUR, the French movie adaptation of The Key to Nicholas Street and thought the story was remarkable. One of those dysfunctional family melodramas that crackles with tension, is enlivened with wicked dialog and impassioned emotions. Jean-Paul Belmondo is fantastic in that film. 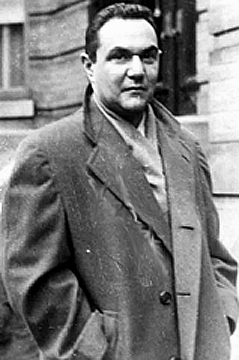 Ellin is another of the lucky crime writers whose popularity during the 50s and 60s drew TV writers to his work. His imaginative spins on crime and original plot ideas also probably made them easy fare for dramatization. He showed up on Hitchcock’s series no less than eight times! Thanks for all the feedback John – if you can, you should also track down Mirror, Mirror on the Wall – it may be less heralded, but it’s a pretty fantastic book. I have yet to track down À double tour (aka Leda aka Web of Passion aka A Doppia Mandata) though I love Chabrol (when he’s on form) and it is available on DVD in the UK so expect a review shortly (the book too probably – putting together this brief profile has really made me want to go through all his books again)- thanks for the prompt! I have never read anything by Ellin but since I’m on the short story bandwagon these days I’ll check out some of his stories, apart from his novels. I like reading novels that have a new protagonist or a different set of characters every time. Ellin didn’t write under the burden of a “series” hanging over his head which, I am sure, must make each of his novels a refreshing read, something new to look forward to — certainly “innovative” as you say. Thanks, Sergio, for putting me wise to Ellin’s work. Very much my pleasure Prashant, thanks for the kind words, as always. I really hope you enjoy these, as I consider these very highly indeed, as you will have seen. Ellin picked up a vast gallery of honours in his 40-year career, so although its been a quarter of a century since his death I think there are many out there who still revere his work too. A fascinating post about an author that I’ve never heard of. Doesn’t quite sound like my cup of tea, but a great post, nonetheless. Cheers. Thank you Steve, very kind. Ellin was a superb craftsman and his short stories are very much in the macabre vein of Dahl and Collier and there are some wonderful surprise endings too. The novels leap from one type to another, but he never wrote a duff one that I’m aware of. Well worth looking out for. I cannot find any other mention of a novel on your list for Ellin’s works: The Other Side of the Wall. Are you sure that’s one of his works? 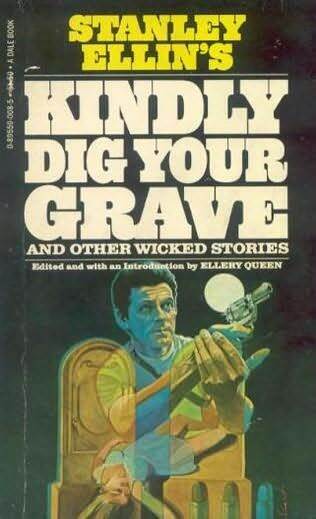 Thanks for the feedback Bruce – although the title is present in several bibliographies, I don;t have a copy and it is the title of a short story in the Kindly Dig Your Own Grave collection, so maybe it was an alternate title for that collection or a novel that was announced but which never appeared? I have removed it from my list of his novels, though would love to be wrong on this. Thanks for your quick reply. Since I am reading all of Ellin’s novels, I wanted to make sure there wasn’t a little known work I might miss. If I had another lifetime, I might write a monograph on the Ellin’s writing career. You didn’t mention The Winter After This Summer, which I view as evidence that Ellin sought success as a non-genre writer, after his undisputed success with mystery novels and short stories. That novel, in my estimation, comes very close to success as a straight novel (I don’t like that term, but can think of no other). It’s marred by an inconclusive ending which doesn’t fulfill the promise of the earlier chapters. His next novel, The Panama Portrait, falters even more, as if Ellin were not sure how to proceed. Then comes House of Cards: an expert tour de force of a thriller, but absolutely void of the thematic depth of his earlier work. After that, it seems clear he wrote a string of shallow thrillers which, I assume, sold well, but added nothing to his stature as a serious writer. One partial exception is Stronghold, but, again, the ending did not substantiate any of the promising themes suggested by the story. Mirror, Mirror on the Wall, The Dark Fantastic and Star Light, Star Bright show some return to his earlier depth, but seem to me very sketchy and underdeveloped. I haven’t read The Luxembourg Run or Very Old Money, but they seem to also be in the vein of his other “efficient” thrillers. I hope I haven’t bored you with the substance of my unwritten monograph! I don’t run across too many people to talk about Stanley Ellin with. Thanks Bruce – I haven’t read that many of the globetrotting thrillers but liked them less. Mirror, Mirror is however one of my favourites for its delving into largely uncharted psychosexual waters – I have The Winter After This Summer on my TBR pile in fact. I have not read any Ellin for a bit so much get back into him – thanks chum.